This is a product review for Dermaoil. Dermaoil claims to be an effective remedy for stretch marks, acne, scars, uneven skin, hands, cuticles, nails, and sun damage. This product is also an anti-aging agent with the ability to rehydrate your skin. Read on to know more about this product. Sunflower (Helianthus Annuus) Seed Oil- retains skin moisture, which helps to combat wrinkles and retain a youthful skin. Jojoba (Simmondsia Chinensis) Seed Oil– treats acne, moisturizes the skin, fights infections, and fights aging. Tamanu (Callophyllum Inophllum) Seed Oil- promotes the development of new and healthy tissues. It also has antioxidant, anti-inflammatory, and antibacterial properties. Macadamia (Macadamia Ternifolia) Seed Oil- beautifies the skin by maintaining a youthful glow. 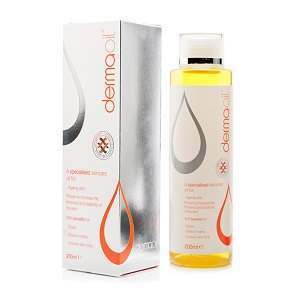 Dimethicone- smooths the skin by filling fine lines and uneven texture. It also helps to maintain moisture by creating a protective cover on your skin. Argan (Argania Spinosa) Kernel Oil- nourishes the skin, reduces wrinkles, reduces fine lines, and protects elasticity. Lupinus Albus- essential for firm and elastic skin. Calendula (Calendula officinalis) Flower Extract- has anti-inflammatory qualities. Lavender (Lavandula Angustifolia) Flower Oil- used for its antifungal and antiseptic properties. Palmarosa (Cymbopogon Martinii) Oil- moisturizes the skin keeping it elastic and supple. It also fights minor infections. Roman Chamomile (Anthemis Nobilis) Flower Oil- helps to heal acne, rashes, wounds, and rejuvenate dry skin. Mandarin (Citrus Nobilis) Peel Oil- helps to maintain a vibrant and youthful skin. Frankincense (Boswellia Carterii) Oil- helps to rejuvenate aging skin. This product does not contain yeast, colorings, synthetic fragments, preservatives, and wheat. Use Dermaoil for external application only. Do not apply it on broken areas of your skin. If you experience irritation, which is unlikely to happen, discontinue use. Dermaoil should be applied for at least three months. Apply twice every day starting from the second trimester. The product label shows the suggested application techniques for different areas of the body including the legs, chest, and stomach. The manufacturer claims that this product is unlikely to cause irritation meaning that there are minimal chances of experiencing unwanted effects. The price of one bottle (200 ml) is $15. We consider this as a reasonable price compared to the price of similar products in the market. You can also buy Dermaoil at discounted prices. Two bottles will cost you $27 while three bottles will cost you $40. A package of six bottles costs $75. Therefore, the more you buy in terms of quantity, the higher the discount. First-time buyers receive a 10 percent discount for their first purchase. We are concerned that potential buyers might question the quality of this product because there is no money-back guarantee. Moreover, potential consumers might question the effectiveness of this product because there are no customer reviews. Based on our research, we believe that Dermaoil is an effective product because it has a strong blend of ingredients that have the necessary qualities to maintain a healthy skin. The positive features associated with this product include low chances of experiencing side effects and price discounts for bulk purchases. However, the lack of customer reviews and a satisfaction guarantee are significant drawbacks. David Carney	reviewed Dermaoil	on August 15th	 and gave it a rating of 2.5.